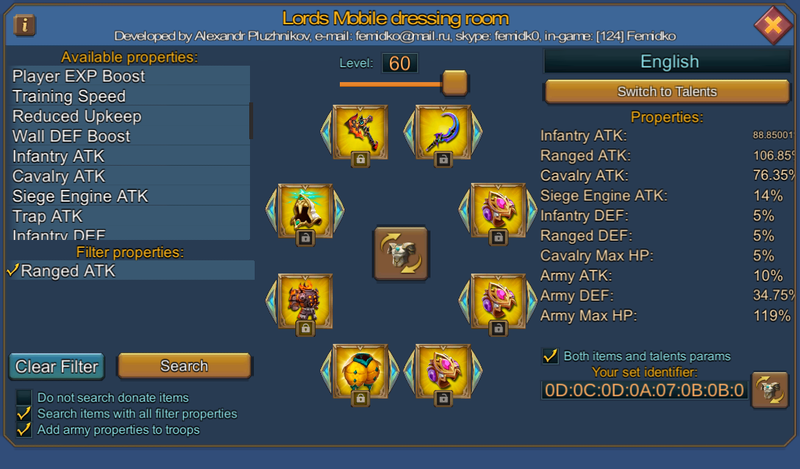 Lords mobile: How to Play When “F2P”? This game has seen the opposite sides of the same coin, on one hand there are the "f2p" and on the other hand there are the "p2p" (in here there's another distinction to be made, between those moderate spenders and the "pay to win" players). So, is it possible for f2p to evolve in this game that tends to be prefer p2p over anything else? My answer would be yes and to this you have to add a lot of patience, simply because it takes time. Best advice, try to find an active guild (that hits the help button [I've been in some guilds where it's hard to get the help bar max out either for a research or a construction and this slow down your progression], activily monster hunt [the more gifts you get the more speeds ups and gems you'll accumulate and this will help you grow so much faster, just test it ;)], do darknest rallies [you do get speeds, energy, gems, rss lol], etc.). 1 – Depends on what type of player you are. Either you are a fighter, a trap, a support or a hyper farmer. For the first case scenario (a fighter), you need to focus on research and more specifically on military research as well as pushing your castle to 25 (thus, to academy 24 to get a max profit from your military researches ie lvl 9). Don't hurry up to get to 25 while forgetting to work on your research, always max out your military research for you academy level. If you are pushing for t4s, make sure you save all your gems and speed ups, don't use them under any circumstances specially your gems to train troops. That’s forbidden. Only use your speed ups when there’s a “Watcher research” event going on, in order to finish your military tab. Use your gems during guildfest to buy the your special items whether it's war tomes, steal cuffs and soul crystals [grab the 141pts quest "Use 50k gems" grow while helping your guild]. For f2p, guildfest is a good opportunity to get your special items, grab those items over the other 2 choices if you don’t have your buildings max out. 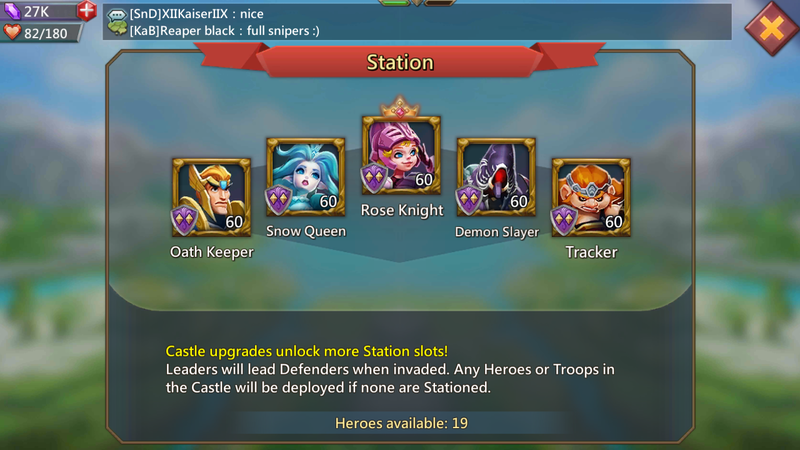 Once military is done, focus on "monster hunt tree" [having those researches up to level 9 is a great help since you’ll get speed ups and gems out of it and you’ll help your guild grow as well] → this applies to everybody. Work on your war gear! F2p can have just as much fun at war than a p2p, it's a matter of being wise when picking the gear that you’ll use when attacking. For the accessories, you are free to pick either the lost relic island (1) or the aqua anemone (2). the last one is harder to get to gold, you need to smash the tidal when it shows up. That's an example of gear you should have. If you are lucky you can get sweet drops from chests, guild gifts and special events, be careful on what you are aiming to building. A common gear piece, even if it's a champion piece, doesn't replace the value of a gold gear piece. Jewels! it's a pain in the arse, but with a bit of work and luck, it will be your best ally. Save your guild coins and buy the “jewel chest” on the Guild shop [do not spend gems on it! ], guildfest also gives as rewards jewels, so pick them up! (Attack jewels preferentially). Troops, 'cuz what the point of having a nice war gear with a nice research if you don't have any troops!? The "Skirmisher building" is the best option, unless you want to be a trap (for more info please check Alpha Smurf videos or “Hunter hanse" for a f2p trap account on YouTube). – A skirmisher has as many troops as he can protect ie 250k troops in shelter, 250k troops in fake coalition and an additional of 140k troops. It’s not compulsory though. The idea is to have as many troops as your infirmary space can hold, the maximum being 640k beds (more if you have the familiar). Second case scenario (a trap). Everything that has been said above applies to you. Military should be lvl 9. As for the other researches, only work on “Upgrade military” in order to unlock "Quick Swap" lvl 1 and 2. No other researches after that, since your main goal is to keep your might as low as possible. As for the buildings, only those necessary to build your castle up. There are 2 types of traps. One that has loads of troops (over 3m troops) and another one that has around 500k t3 troops and get reinforced by his guild mates (+1m). In both cases, you need to be online, and your leader must be outside the shelter, otherwise all the stats from your gear and talents do NOT apply to your defending troops. Third case scenario (a support). Has all the researches mentioned above. Then, he is free to pick the researches that suits the most his gameplay. Subsidies, "Field triage" or "Bigger infirmary" should be a priority, as well as unlocking the familiars pacts. Fourth case scenario (a hyper farmer). Not military driven. Doesn't mean he can't work on that tree, get a nice war gear and have some troops! He is more focus on getting the best out of his castle by being a hyper of one or 2 rss (in case he is gold or food hyper or both (why not lol), but in this case the player has little to no troops ‘cuz only one infirmary). Those are the main aspect that you should take into account as f2p (although everything that has been say above applies to all players). It's needless to say that you must max out your treasure trove to get extra gems. Work your way up in colosseum to get more gems. Your HEROES ! Do not overlook them. Get Rose Knight ASAP then with Bobin'Goblin, get them to gold ! Do NOT miss out on that 20% atk that they both offer. For all the scenarios, keep an eye on the heroes that you have as stationary on your wall. Make sure they offer an atk boost and that they are gold grade. And DO NOT use trickster or any other administration hero, they don’t boost any of your troops with atk skills. Administration heroes have this unique ability to give you boost instantly from the moment you unlocked them, which means that they do NOT required to be the leader to have their skills active. 2- Now f2p aspect of it. I'm a f2p player, with t4s unlocked. How was I able to make it? Have to admit that it was never my intention to be t4 player, simply because it seems impossible to reach it. So I got up to 130m might with no academy 25 and research almost max out. I did had Battle hall 25, Prison 20 and Altar 19 ish (maybe it was 17). My guild was rather active and getting 1k-2k gems per day was "normal" (depended on the days lol), treasure trove was my best friend and I learn how to take advantage of the multiple events that the game offered. Kvk (6k gems once you reach solo tier 3 [funny thing is that back then gathering didn't offered any points, now it's easier]) and guild fest (speeds and gems or any of the special items) were on top of my list. Gem loads and the special events were the second main thing that helped me get my Academy to 25. There was one event with the Orgres (gremlins and trickstars were out every 3 hours) during Halloween last year, during 2 or 3 days those monsters would show up and I would hunt them non stop! Got 200k gems out of them. REALLY. The only time I did hunt them was when I was sleeping lol. But HOW is it POSSIBLE? I was in a dead kingdom which means that there was nobody hunting them. Best advice when those special event show up, try to find a dead kingdom and migrate there (it's a waste of scrolls, but you can win a lot if you're f2p). Colosseum is also your friend. It's true that it's hard to reach the top 300, personally I struggle a lot unless I'm in a dead kingdom lol. But gems are gems and even if you get 10 gems every 3hrs it's better than nothing at all. – Finish solo war tier 3 in kvk (if you don't want to attack, shield and go gather in the enemy kingdom, never on your own kingdom you won't get anything from it; same applies to monster hunt). – Guild fest (be picky ! okay that's wrong, but be helpful in your guild, it's the only time where you can get free items so why miss out on that opportunity? As a guild always aim the highest tier since it gives the most rewards and unlocks gauntlets to go further). – Gem loads (harvest them, but don't steal them [actually it's one of those days where all hell breaks loose] always be careful specially with the lvl 5 ones). – Special events (grelims, trickstars, orgres, serpent vizier, among many others, take advantage of them). Personally I would recommend to go to a dead kingdom, but if migration is not an option try to find a spot where there aren't many guilds or players around (in all the kingdoms that I've been I've bookmarked a spot where I would always go for those events, not many souls around).